Well I got yet another award. It came from, Thoughts From an American Woman. I am feeling awful special, thankful, and humbled by this award. I had no idea I would ever get one award let alone nine of them. I also have one more to accept so that will make it ten blog awards. I cannot tell you how much it means to me. Please stop by and check out her blog Thoughts From an American Woman. Tell her I said hi! 3. Whom do you aspire to be like? Willy Wonka or Me! I strive at being different, being me. 5. What are the best and worst things about blogging? Worrying no one will read what I write, and getting comments you do like it. 6. What was the last website you looked at? Slankets. 7. If you could change one thing about yourself what would it be? Be pain free. 10. Tell us something about the person who nominated you. She has given me a lot of support and she does not like Slankets. Now to list the woman….Since not all bloggers tell us whether they are woman or men so I am putting an apology right here! Sorry I did not know. I love all of your blogs and thank you for your support on mine. Remember you do not have to accept the award but know I think you are cool! The chicken itself, they scare the heck out of me, even more than snakes. And the whole chicken ready for cooking. Someone use to chase me around with a chicken on their hand and it was swinging, Yikes I am scared for life! 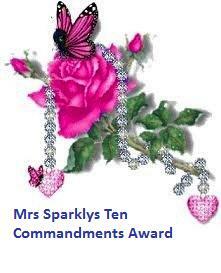 Hey Nancy, this award looks mighty “Fancy” for a “NotsoFancyNancy” Blog!!!! 🙂 Take care and God Bless…..
Wow Nancy! Thank you so much. From now on, I am going to call you “Fancy pants Nancy” since you are all sparkly! Congratulations! I’ve never heard of slankets before. And how can anyone be afraid of chickens? (come to think of it, I was when I was a kid, but not recently). I like your ‘being different’ concept. Yeah! Yahoo! & Congratulations! Now I’m off to click on your nominee links. Thank you, Nancy! I I do love reading about your father. Now, what’s a slanket? OK, I just checked — a blanket with sleeves. Got it!